CarGurus has 34,799 nationwide Renegade listings starting at $9,499. 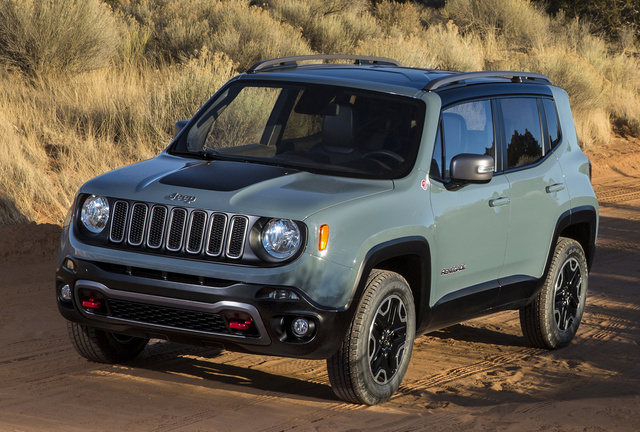 Jeep's all-new, capable Renegade may be the smallest vehicle in its fleet, but it packs a seriously big punch in the small crossover segment. Jeep's Renegade is all new for 2015 and introduces the old American brand to some new foreign concepts. This small crossover is built in Italy and will likely be one of Jeep's biggest global sellers, but the small ute has a long road to impress American buyers. With off-road chops and a decent powertrain, the Renegade is an attractive option in the small crossover segment—albeit at a price. The 2015 Jeep Renegade is Jeep’s (newest) answer to the small-crossover boom and will likely replace aging models such as the Compass and Liberty. The small, FIAT-based crossover is built in Italy, but serves a much larger, global audience. No fewer than 16 different powertrains will be stuffed under the hood worldwide, but for America, we get only two engines: a 1.4-liter turbocharged 4-cylinder or 2.4-liter four. The Renegade is Jeep’s newest crossover and shares most of its architecture with the coming FIAT 500X. Although Jeep’s funky crossover can carry the “Trail Rated” Jeep badge, most of the cute ute’s duties will be limited to light detail and the occasional foul-weather day. For 4-wheel-drive (4WD) versions of the Renegade, Jeep used its “Active Drive,” an electronically controlled, fully disconnecting 4WD system that doesn’t use a center differential and is controlled only by the car’s internal computers—no buttons to press or levers to pull. For fans of the Jeep brand, that may sound like blasphemy, but for many shopping in the small SUV category, that may also sound like par for the course. Nonetheless, the crossover’s high hip point, excellent outward visibility, and 30-mpg estimated fuel economy may speak more loudly to a typical small SUV buyer than brute-force off-road capability. 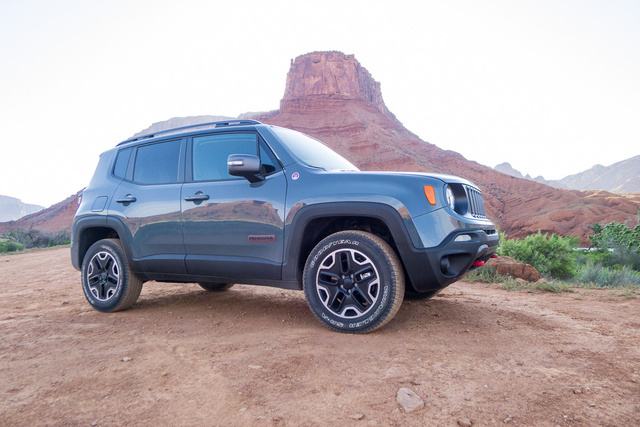 The Renegade follows the Cherokee’s trim levels and begins with the Sport. From there, buyers can opt for more interior comforts in Latitude versions and further in Limited trim. Sport Latitudes can have either front- (FWD) or 4WD powertrains and can be fitted with either a 1.4-liter four with a 6-speed manual transmission as standard, or a 2.4-liter four with a 9-speed automatic transmission. In Limited trim, the Renegade is available only with a 2.4-liter four and automatic transmission in either FWD or 4WD powertrain configurations. 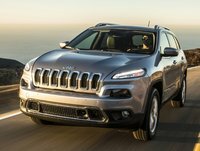 An off-road version, dubbed the Trailhawk, is available—similar to the Cherokee—and is available only with the 2.4-liter four and automatic. It’s worth noting that the Renegade, unlike many new cars today, can be ordered with hand-cranking windows, no air conditioning, a radio only, and steel wheels. That may be an homage to the famously unfussy cheap Jeeps of yesteryear or a coy way to advertise a rock-bottom entry price of $17,995 for a car of which it’ll sell approximately 3 copies. Take it how you will, but stripper cars are an endangered species these days. The Renegade’s first priority is likely efficiency above anything else. The two available 4-cylinder engines, which produce 160 and 180 hp, deliver mileage in the high 20s, according to the EPA. The first mill, a 1.4-liter turbocharged four that was borrowed from parent company FIAT (which it's used in many different cars), makes 160 hp and 184 lb-ft of torque. That’s married to a surprisingly competent 6-speed manual transmission that makes the most of what you’re getting for under $20,000. The downside to rowing your own in the Renegade? Premium fuel is recommended for the busy little motor, and towing anything larger than your sandals isn’t a good idea. The small turbo four manages 24 mpg city/31 highway/27 combined. The bigger engine, a 2.4-liter four, dubbed TigerShark, was taken from the Dodge Dart, Jeep Cherokee, and other global cars and married to the same 9-speed automatic transmission in those previously mentioned cars. That gearbox has had a particularly difficult birth—when it first appeared in the Dart, it seemed mildly confused—but the transmission’s behavior is slightly better in the Cherokee and the Renegade. The 2.4-liter engine’s 180 hp and 175 lb-ft of torque rating are only slightly more potent than the smaller motor's, but the TigerShark can tow 2,000 pounds and drinks Regular fuel. With 4WD, the 2.4-liter returns 21/29/24. Both engines are surprisingly competent in their respective arenas—the smaller motor for around-town duty, the bigger engine for light off-roading—although neither engine is particularly overpowering. If you’re expecting to need 4WD at some point in the future, you may want to lean toward the 2.4-liter engine, although there’s no way to avoid the 9-speed in that configuration. As in the Renegade’s main competitors, the Kia Soul and Nissan Juke, there is a surprising amount of feedback from the engine that actually makes driving the small Jeep fun. The 1.4-liter engine is expressive without being loud or annoying and makes its peak torque at a relatively low point (2,500 rpm) in its power band, so it’s actually a little fun, too. 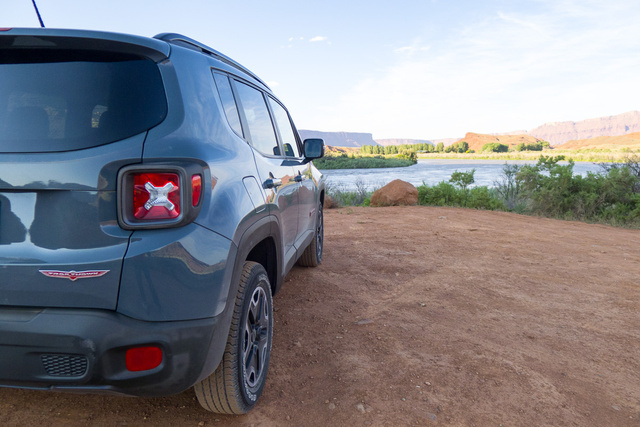 At 500 pounds lighter than the Cherokee, the Renegade’s 2.4-liter engine is a better fit in the smaller crossover as well. Jeep markets the Renegade as 4WD, but that has been a point of debate. Although the system can fully disconnect from the rear wheels, the absence of a transfer case or center differential has sparked 4WD versus AWD debates in plenty of forums. In practice, the system does all the thinking for you and may be closer kin to AWD systems than 4WD—even though it’s still in a Jeep. Even though it wears a Jeep badge, the Renegade is set up for mostly on-road duty. The Renegade’s steering is light—almost over-boosted—and makes for easier parking and around-town maneuvering. Access to cargo in the rear is easy and around hip level (30 inches), and the elevated seating position combined with a steeply raked windshield, lower belt line, and higher roof offer better outward visibility than others in its segment. Clearly, the Renegade isn’t exactly aerodynamic. Its boxy shape and upright posture collect plenty of wind on the interstate, with a measurable amount of road noise coming through the cabin. Thankfully the bigger tires on the Trailhawk model don’t add much tire drone on top of the road noise. 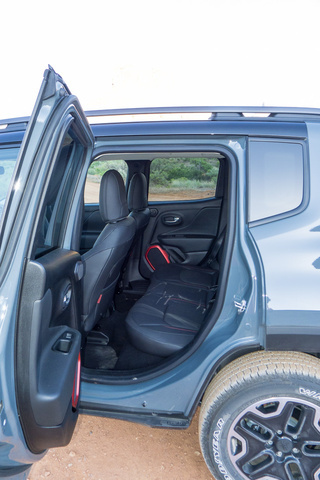 For rear passengers, the Renegade offers 35 inches of ample legroom in the back. I found myself folding my 6-foot-2-inch frame into the back seats relatively easily, and climbing in and out was surprisingly effortless thanks to wide doors and a low step-in height. The Renegade's appeal to older buyers may be a bit of a surprise given its outward appearance. Funky tail lamps, bright red tow hooks, and a paintball-splatter-inspired color scheme on the dash may not scream “retirement village,” but the car’s affordability and capability certainly do. A word about the interior style if you find yourself cringing at words like “Trespass Black” and interior trim inspired by sand surfing or BASE jumping: It plays better in person. 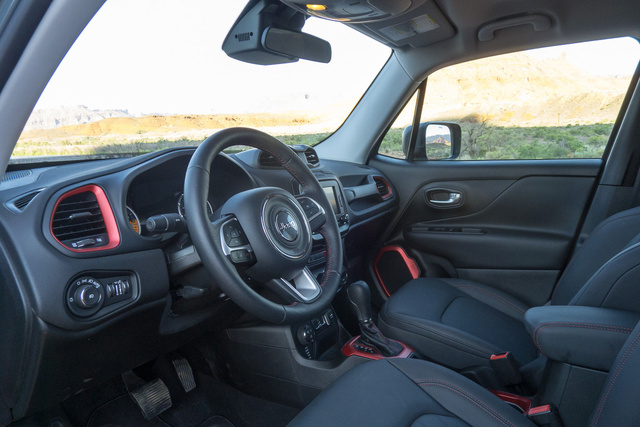 The Renegade’s interior is surprisingly smart considering the size of its interior; its center air-conditioning vents, for instance, are placed on top of the dash, which makes way for bigger infotainment systems and normal-size climate controls. Accents around the air vents help break up what could be a sea of black plastic. Omaha Orange is my pick for best exterior color. Really. In FWD spec, the Renegade sports a modest 6.7 inches of ground clearance. That figure is better in 4WD versions, 7.9 inches, and tops out in the Trailhawk, which has 8.7 inches of ground clearance. The Renegade’s short overhangs and relatively small wheelbase make it surprisingly nimble off-road, even if its engines can’t power it up everything, and Jeep’s terrific Active Drive system (Active Drive Low is available on the Trailhawk with a 20:1 crawl ability) makes the most of its smaller powertrain. The Renegade’s tech headline may well be its 7-inch multifunction display in the gauge cluster, which is available in Limited and Trailhawk trims. The display is bright and easily readable, a gee-whiz technology touch that would be found on crossovers that cost much more than the Limited’s starting price of $24,795. From there, the Renegade is on par with much of its competition. In all trims, the Renegade sports Jeep’s Uconnect infotainment suite, a relatively unfussy but long-in-the-tooth entertainment unit that varies based on price and trim. 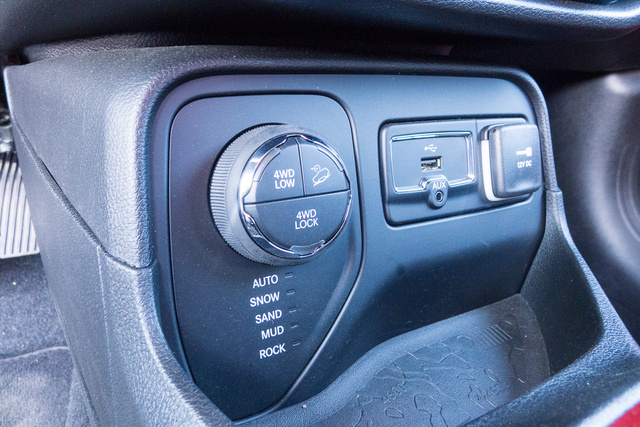 In standard Sport models, a basic AM/FM radio with auxiliary ports comes standard. For $2,385 more, buyers upgrade to a 5-inch touchscreen display with Bluetooth connectivity, satellite radio, a backup camera, and air conditioning (! ), among other upgrades. In Latitude, Limited, and Trailhawk versions, the system can be improved further to include navigation and a slightly larger, 6.5-inch display. Like other Jeeps, the Renegade is littered with Easter Eggs—small visual cues that you’re driving a Jeep. Trail maps stamped into rubber mats, X patterns that mimic jerry cans, and trapezoidal bezels are littered throughout the small cabin. You can look for them all in one go, or discover them one-by-one, but the stamped materials seem like an inexpensive way to draw drivers closer to their vehicles—if only a little bit. I’m surprised more automakers haven’t done the same. The Renegade also has another party trick: My Sky—optional, removable roof panels. We didn’t get the chance to take the roof off ourselves but have it on good authority that the panels, which are surprisingly light, come off fairly easily and fit exactly in the rear cargo area. 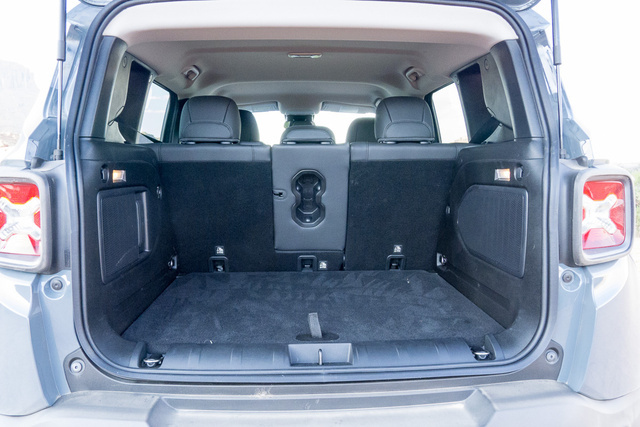 The Renegade features 18.5 cubic feet of cargo area with the seats up, 50.8 feet with seats folded down (and they actually fold flat, which is nice). The Jeep Renegade has not been evaluated by the Insurance Institute for Highway Safety nor the National Highway Transportation Safety Administration. The European New Car Assessment Programme rated the Renegade with a 5-star rating, although it’s important to note that there are structural differences between European and American models. All Renegades have antilock brake and traction-control systems, as well as advanced multistage airbags for driver and passenger. A suite of optional safety systems including lane-departure warning, forward-collision warning, blind-spot monitoring, and rear cross-path detection are available on Latitude and higher versions. Outward visibility may be the Renegade’s best safety feature, and Jeep did a very good job on that front. As an all-new model, the Jeep Renegade doesn’t have enough residual-value data to draw any meaningful conclusions. 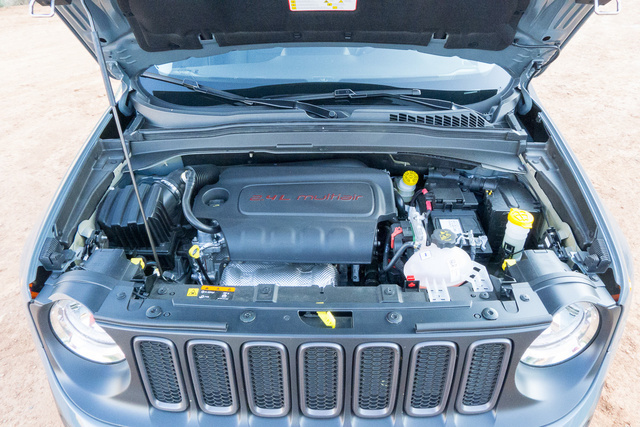 According to JD Power, most Jeeps are middle of the pack for initial quality and dependability, depending on model. The Renegade’s sub-$18,000 price tag can be a bit misleading: That car, without air conditioning—or much at all—may never see the light of day anyway. A volume model with modest amenities will run buyers around $24,000, although a Trailhawk armed to the teeth with options can ask around $32,000. That may be a tall ask considering its intended city-going audience, especially considering a Subaru Crosstrek can come in a couple thousand dollars under that mark and offer the same capability. What's your take on the 2015 Jeep Renegade? Neil It looks awesome, it sounds awesome and its gonna BE awesome! I'm in the market for a fuel sipping yet trail capable and utility focused five seater SUV, i wasn't necessarily looking for subcompact, but it looks like a fun little Jeep! Looking to trade up from an 08 Liberty so i'm needing a home run to forgive the past 6 years haha! bvt I really want this Jeep, but I have been waiting since April of 2104 to be able to see one. We have owned Wranglers, and Cherokees, so an economical, yet cool, Jeep would be a welcomed addition. My only concern is that the launch dates keeps moving further away. It makes me think something is wrong with the new Renegade! lnwolfs I just bought the Lattitude model in Colorado Red. This little guy is peppy with the 2.4L TigerShark engine. My husband has the 2015 Cherokee Lattitude and I didn't care for how his transmission shifts. In the Renegade, I can't even feel the shifts they are so smooth, which I think has something to do with the 9-speed transmission in conjunction with the 2.4L motor. I understand why the interior roominess won "Best in Class". My hubby and I are very comfortable in it. And, the seats are very comfortable. They are cushiony and wrap around you, if that makes sense. It snowed today, and I was happy to have the chance to see how it would handle in less than ideal driving conditions. It was a little trooper. I had it in the "Auto" mode and it gripped the road as if it were dry. The only thing I have found that I would have liked designed differently is the wiper intermittent speeds. Instead of being able to dial in the speed that works best, their are 4 settings. Intermittent slow, intermittent faster, steady low, steady fast. And, of course, you can bump it manually when you want a swipe. I am not a 4-wheelin' person, but I can't wait to hit the mountain roads! my3sons67 I'm trying to decide between the Jeep Renegade or Nissan Juke. I like the look of both even though they're different. I've test-driven both. I'm wondering why the Jeep decided not to put a spare tire in the back of the Renegade...anyone know? TheHorror @ my3sons67: Most manufacturers are doing that these days. It saves space and weight. Users ranked 2015 Jeep Renegade against other cars which they drove/owned. Each ranking was based on 9 categories. Here is the summary of top rankings. Have you driven a 2015 Jeep Renegade? My 2015 Jeep Renegade Lmt edition has message after driving over piece of wood on highway. Car swerved and not stable on road now. I saw a you tube where a young man was told a jeep renegade over 50,000 can used a quart of oil every 750 miles without there being a leak. True or False.